These plates are used on vehicles operated by auto junkyards. They appear on regular vehicles, tow trucks, and parts trucks. This type appears to have started in the late 1940s or early 1950s. They have followed the same colors and format as Used Car Dealer plates. Numbers for these plates are scattered throughout the Used Dealer series, although large blocks are found in the 2100s, 2500s and 2600s. In 1996, “Junk” was changed to “Dismantler”. Around 2002 or so, some Dismantler plates started to appear with a lead zero in the number (see DD-02 on the left). 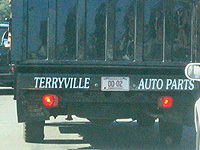 Sometime in the early/mid 2000s, a new type was introduced – “Dismantler Vehicle In Tow”. These plates are the same colors as Dealer/Repair plates for the year. Because there are so many words on these plates (along with the Connecticut state name on the bottom) the dies for the numbers appear to be those formerly used on Motorcycle plates. Click the photo above to see this type (Junk/Dismantler) in use. These plates were used for 10 years or so, and most got really beaten-up. This one has green paint all over it, but I don’t think it’s worth bothering to clean it off. 1997 was the last year for the “Junk” type – replaced by “Dismantler” starting with the 1998 expirations.